1. IE Compatible: This blogger template is fully compatible with internet explorer. 2. 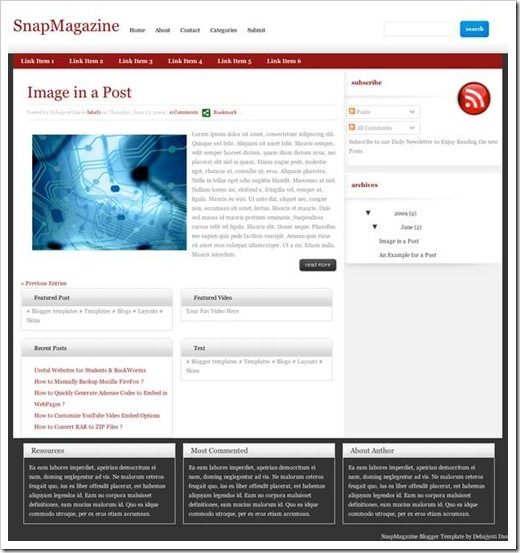 SEO Optimization: SnapMagazine is designed for Search Engine Optimization (SEO). This means that your posts will get better results in search pages. 3. Auto Related Posts Plugin: This template automatically adds related posts based on labels. 4. Read More: Read more posts hack is already included in this template. 5. Attractive Subscribe Button: A cool and attractive subscribe button is added to let your visitors easily subscribe to your feeds. .-= Tech @ InkAPoint´s last blog ..How Erroneous is Google AdWords? =-. Very nice color scheme. Black looks great with red – it’s just so… professional. Amazing, love it! .-= Gagan´s last blog ..Warner Bros. Releases Set Of Four Harry Potter And The Half Blood Prince Personas For Mozilla Firefox =-. professional magazine style. Thanks a lot.